“Functional Safety” is a discipline that concerns itself with instrumented systems that are intended to provide a safeguarding function. Instrumented systems typically comprise sensors, logics and actuators to provide a control function or a safeguarding function for processes in chemical, petrochemical or other process industries. Instrumented systems that execute a safeguarding function (or “safety function”) are generally referred to as Safety Instrumented Systems. These systems are subject to IEC 61508, the international standard for safety instrumented systems. • settings for safeguarding action are normally fixed and follow from plant design, whereas settings for control action can vary depending on the actual process conditions. A Safety Instrumented System plays a critical role in the containment of hydrocarbons and of high pressures and as such acts as a key barrier, preventing an unsafe condition leading to an accident. 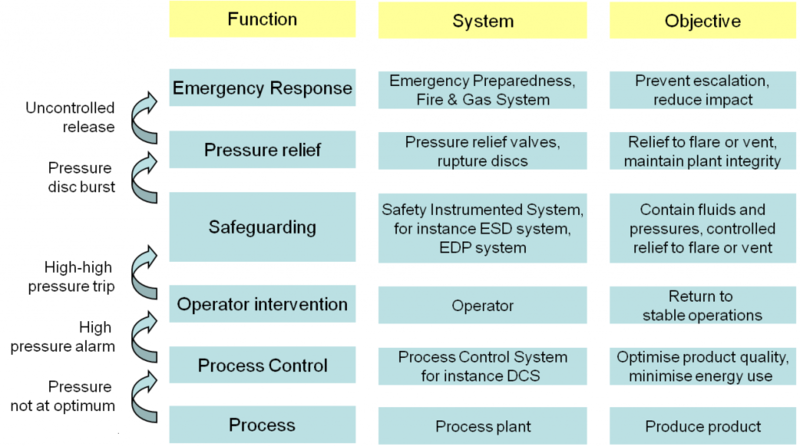 In the above visualization of different layers of protection, the Safety Instrumented System acts if both the Process Control and Operator intervention layer fail to address the issue at hand. A failure of the Safety Instrumented System, in turn, would likely lead to an uncontrolled relief to flare or vent, or possibly worse. It is for this reason that the Safety Instrumented System has to fulfill stringent criteria regarding availability and the probability of failure on demand.